Product #21547 | SKU SLRC201 | 0.0 (no ratings yet) Thanks for your rating! The black SLRC-201 SLR Zoom Holster from Case Logic is designed to carry and protect most digital SLR cameras with a zoom lens attached. The case is made from nylon with a memory foam interior to protect the LCD screen. There is a hammock system that suspends the SLR camera body with attached zoom lens above the bottom of the case. A waterproof EVA ((ethylene vinyl acetate) base withstands the elements and allows the case to stand up on its own. The SLRC-201 holster has 3 zippered pockets that can store memory cards, batteries, cords and other accessories. 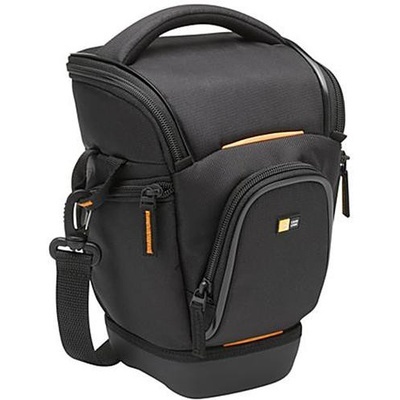 It is carried by a padded handle or a removable, adjustable shoulder strap with pad.